Most visitors to Russia enjoy buying handicrafts of some kind, such as matryoshka dolls. In early times most of such items were crafted from wood by skilled village craftsmen. A traditional form of wood painting is called khokhloma. For centuries Russians ate from meticulously carved and painted bowls, and they used spoons, cups, and other vessels made of wood. Entire villages might be devoted to making wooden objects of one kind or another. 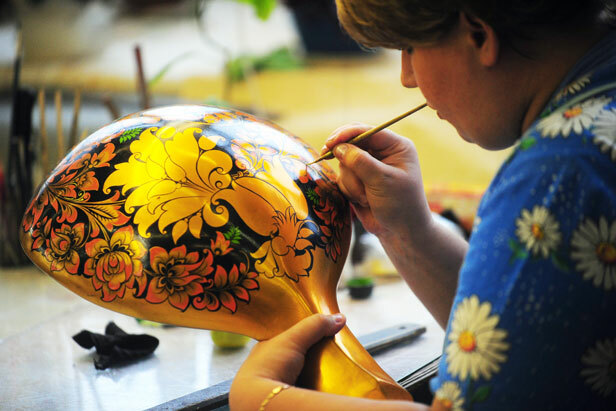 The Kursk Woodcrafts company was founded in the 1970s and its artists are preserving the Russian folk art of hand-painted wares. Thanks to these souvenirs, dining tables of people in many places around the world are decorated with pretty colors of the Russian countryside.